Recently the U.S. Food and Drug Administration (FDA) gave approval of a potent new opioid painkiller, Zohydro. This new opiate, manufactured by a pharmaceutical company named Zogenix Inc., was approved by the FDA in October of this year, despite an 11-2 vote by its advisory committee against its release. Some of the reasons for the vote and some of the worry and public outcry from the public, medical and addiction treatment professionals concerns this new drug’s potential for abuse, diversion for illegal use and accidental overdose. On March 5, Zogenix announced that its sales forces have begun educating doctors, pharmacists and other prescribers and giving them patient educational toolkits. So what is Zohydro? How potent is it? How bad is it? And will it really cause mass destruction and the zombie apocalypse that everyone seems to be predicting? Zohydro is a prescription opioid or painkiller. Like OxyContin, Zohydro is a higher dose of a familiar opioid. OxyContin contains the same basic ingredient, oxycodone, as Percocet, and Zohydro contains the same basic ingredient, hydrocodone, as Vicodin. 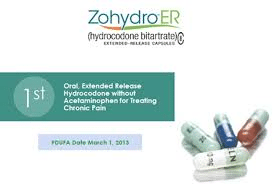 However, unlike some older drugs like Percocet and hydrocodone, Zohydro contains no acetaminophen. A drug addict or someone abusing these pills often looks at acetaminophen as “cut”, or an added ingredient that makes the drug less potent or pure. Zohydro, like OxyContin, is a pure narcotic. One of the major issues that medical and addiction professionals are having with Zohydro (and one of the main reasons that the majority of the FDA board voted against approval of the new drug) is that, unlike the new tamper-resistant formulation of OxyContin, Zohydro can easily be crushed and then snorted, smoked or injected. Although Zohydro in it’s approved pill form is time released over the course of twelve hours, because it has the ability to be crushed and snorted, smoked or injected the factor for potential abuse increases exponentially. Critics have been outspoken that the FDA did not wait for a non-crushable version before the drug was approved. Although there is a very very small percentage of chronic pain patients that Zohydro may help, the overall understanding is that this drug is the work of pharmaceutical companies flexing their inherent muscles with governing bodies and pushing a dangerous painkiller with a large abuse potential because they see high profit margins. Current society is always looking for a quick fix and large corporations are always looking to make a quick buck off the need for a quick fix. Do people deal with chronic pain? Absolutely. Are their patients that could use this drug? Sure. However, why couldn’t they use one of the many many MANY opioids already on the market? The medical industry is flooded with prescription painkillers. Why does it need another one? And not just another one, but one that is extremely more potent with a high potential for abuse and overdose? And let’s be honest, do the pharmaceutical companies know that there will be substance abuse and chemical dependency and addiction issues with Zohydro, just like there was when the latest painkilling miracle drug OxyContin hit the market? Absolutely! And do those same pharmaceutical companies have a stake in more people with drug issues needing treatment and getting medications that can help them through an opiate detox or God forbid get places on opiate replacement therapy? Of course they do. So why is this all happening? What is the answer? So will Zohydro kill us all? No. Will many people get addicted to this drug? Probably. And if they do, will they inevitably turn to heroin as we’ve seen recently with the OxyContin pill mills getting shut down? Of course. Will more people overdose and die? Probably. These are harsh realities but past always predicts future and the evidence from OxyContin suggests that Zohydro hitting the market will not be pretty. It will more likely cause much more harm than good. Prescription narcotic and painkiller addiction is no joke. The addiction rate is high. The detox is terrible and the relapse rate is high. The potential for overdose and death is high. The answer is detox, comprehensive addiction treatment and then aiding the addict into lifelong recovery. If you or someone you know is suffering from a painkiller, opiate or prescription pill addiction, and needs detox and treatment please call Maryland Addiction Recovery Center at (410) 773-0500 or email info@marylandaddictionrecovery.com. For more information on all the treatment services at Maryland Addiction Recovery Center, visit the web site at www.marylandaddictionrecovery.com.